Fermilab has a small herd of American plains bison (Bison bison) as a continuation of a tradition started by our first Director, Robert R. Wilson. It was his idea to bring bison to Fermilab to recognize the prairie frontier of the land while the scientific frontier was being explored using particle accelerators. The Fermilab bison graze in a pasture and are often visited by the public. 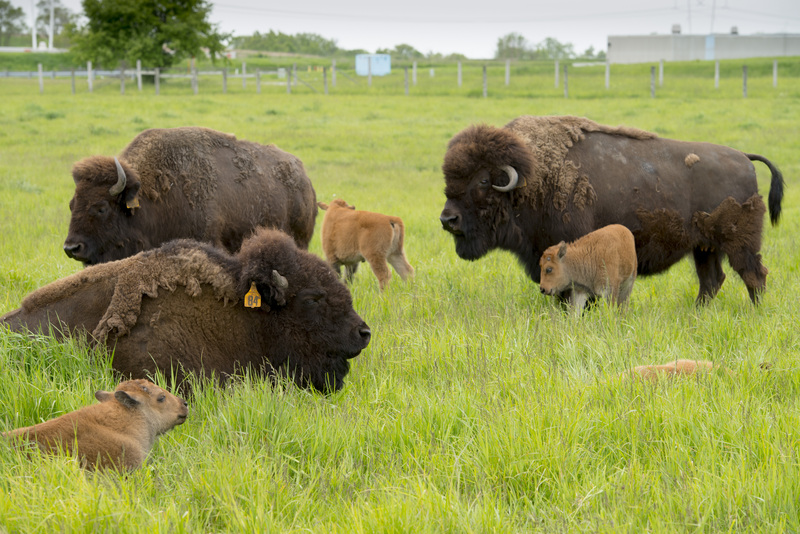 Conservation of bison as a species, including its genome, is an internationally recognized priority. In October 2015, the 17 animals making up the Fermilab herd were tested for cattle gene introgression. All animals showed no evidence of cattle genes in the mitochondrial or nuclear DNA. An ELM subcommittee is considering additional ways in which this herd might help achieve national conservation goals for this iconic, keystone species of the tallgrass prairie. The coyote is the top predator at Fermilab and throughout much of the Chicago region. These animals have had impacts on populations of woodchuck, eastern cottontail, red fox, and many small mammal species, as well as Canada geese. The coyote population requires little active management because population size is dependent on a relatively constant number of territories that can be occupied. White-tailed deer are present in numbers suitable for the habitats they occupy. Other common large mammals found at Fermilab include: raccoon, opossum, striped skunk, beaver, muskrat, and mink. Several studies looking at small mammals have been conducted through the National Environmental Research Park program since the early 1980s. 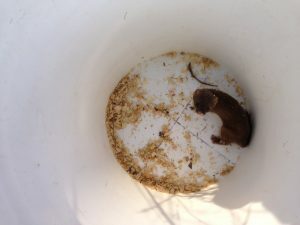 Generalists such as the meadow vole, white-footed mouse, and short-tailed shrew, thrive, but further monitoring and surveys are needed to assess abundance and distribution of conservative species across habitat communities. Other small mammals vouchered at Fermilab include; prairie vole, house mouse, masked shrew, least weasel, long-tailed weasel, eastern chipmunk, thirteen-lined ground squirrel, gray squirrel, fox squirrel, and southern flying-squirrel. Bats are important components of functional ecosystems in Midwestern prairies, woodlands and wetlands. They consume insects, including crop and human pests, pollinate some plants and disperse seeds. Bat conservation is an important research objective as many species are declining. The Northern long-eared bat (Myotis septentrionalis) is listed as threatened under the federal Endangered Species Act. Four out of five mammal species listed as endangered and two of the four listed as threatened by the Illinois Department of Natural Resources are bats. Additionally, the little brown bat (Myotis lucifugus), which is not a listed species, is one of 12 priority wildlife species within the Chicago Wilderness region. In 2017, Fermilab began working on a multi-year study with the Illinois Natural History Survey to better understand bat species presence and distribution across the site. Species located thus far are common and include; Big Brown, Eastern Red, Evening, Tri-Colored, Silver-Haired, and Hoary bats.